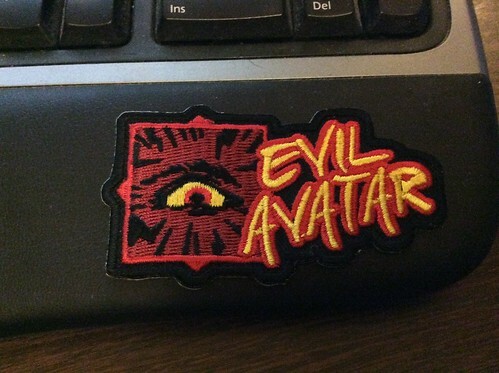 The Evil Avatar Patch is Here! The patch has arrived! This is our first physical reward for Patron supporters with more great things to come in 2017! I will get these in the mail right away for all our Patreon supporters! I'm getting that tattooed on my male member! That looks pretty sweet dude! When he says jeans, he means Wrangler! Hey man, it's a nice jacket for the money! Also available with white fur collar! Don't remind me! I think I had one. I've still got this crazy 80's denim vest that I never wear. Eventually, I'm going to have a bunch of patches sewn onto it. I was planning to put all my DC hero patches on it. Thanks! They came out great. I'll have one out to you soon. Very nice! Wife suggested I should ask for a jean jacket for Christmas. I'd put that on a Jansport backpack. Send me a message with your address so I can get one out to you! If you are a Patreon supporter send me a PM with your name & address so I can get a patch out to you! Nice! Great to see people get these.